From Lake Mohave and Katherine's Landing we head back towards Quartzsite, Arizona. On the way is a quick stop in Fort Mohave for an oil change for Lady Blue and haircuts for Jan and Bruce. 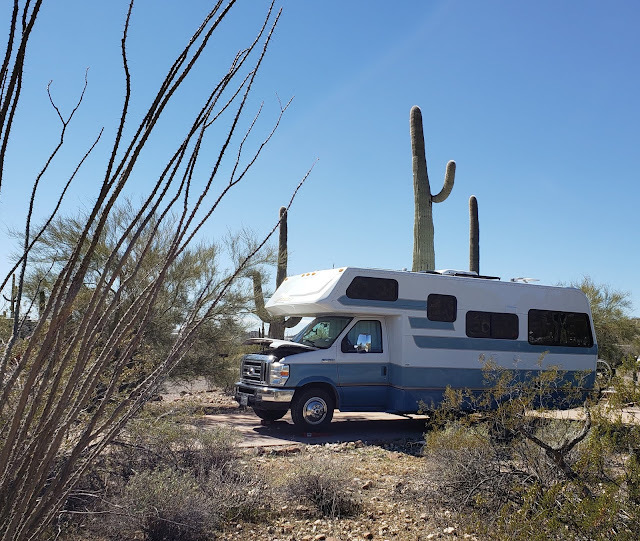 A quick one night stay on BLM land in Quartzsite and we head out to Buckeye, off Route 10 for groceries and a bank stop. 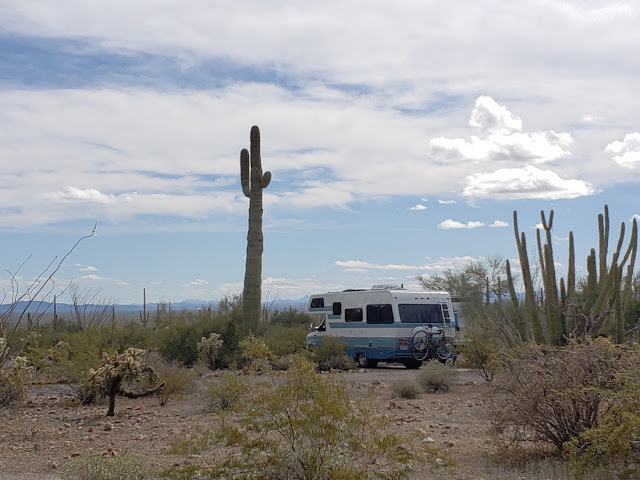 A short distance south on Route 85 to Gila Bend and a one night stop at KOA Journey( a wonderful laundromat). 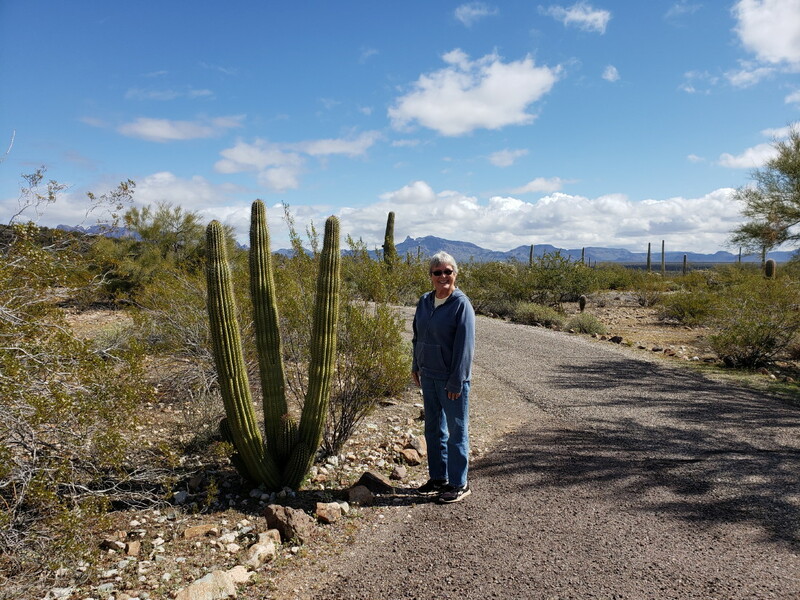 Then on our way further south through Ajo and Why to Organ Pipe Cactus National Monument , one of our favorites! Oh, and if you are not sure what organ pipes do-- here is another link for that--not too many people get to see or hear real organ pipes any more. Organ Pipes and a listen. The first picture above was of our camping spot at Organ Pipe. On a hiking trail to the Visitors Center Bruce has found a huge Saguaro. Either that or he shrunk. It may be desert, but there are many signs of life around. 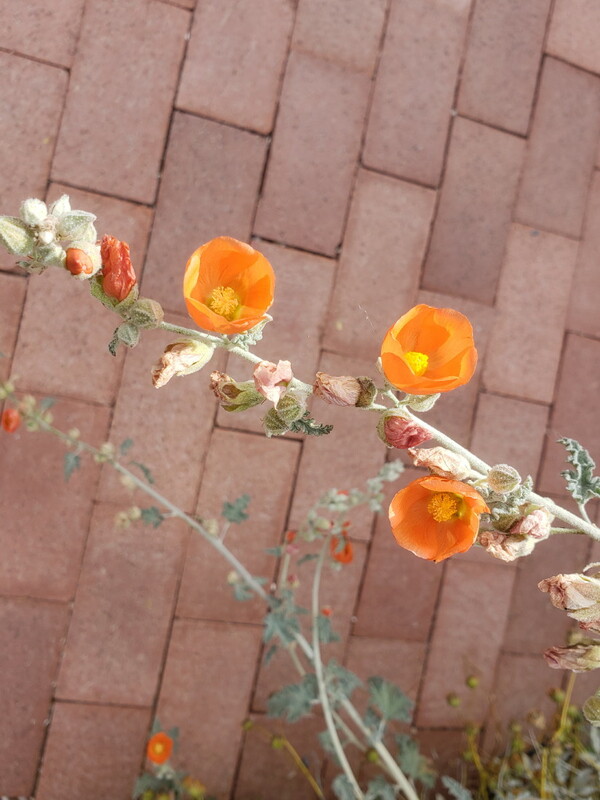 These flowers are close to the ground and only a few inches tall. 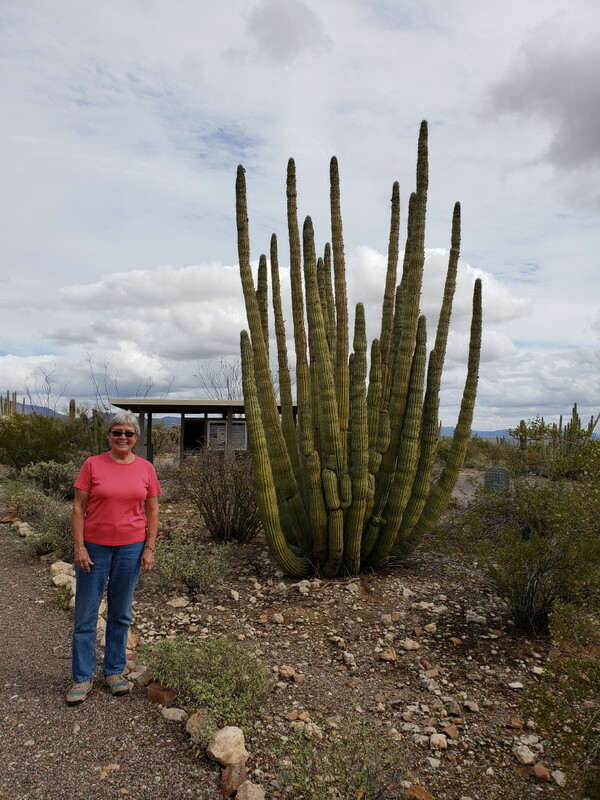 This video was on that walk when we came across a large number of Teddy Bear Cholla cactus. 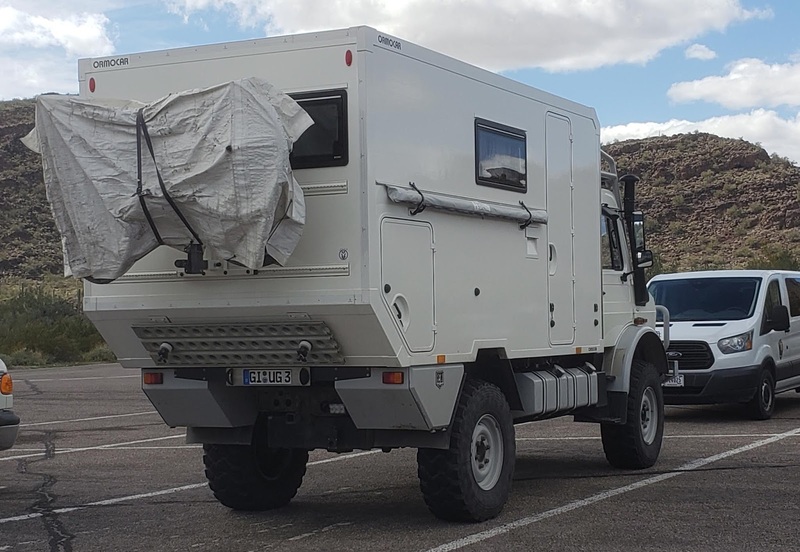 This is a year that we have seen many European camping vehicles. Most of them have been high clearance , wilderness type of vehicles. This link will show some pictures of this German vehicle. Some of the pictures look like adapted versions of dump trucks and others like something from an adventure movie. 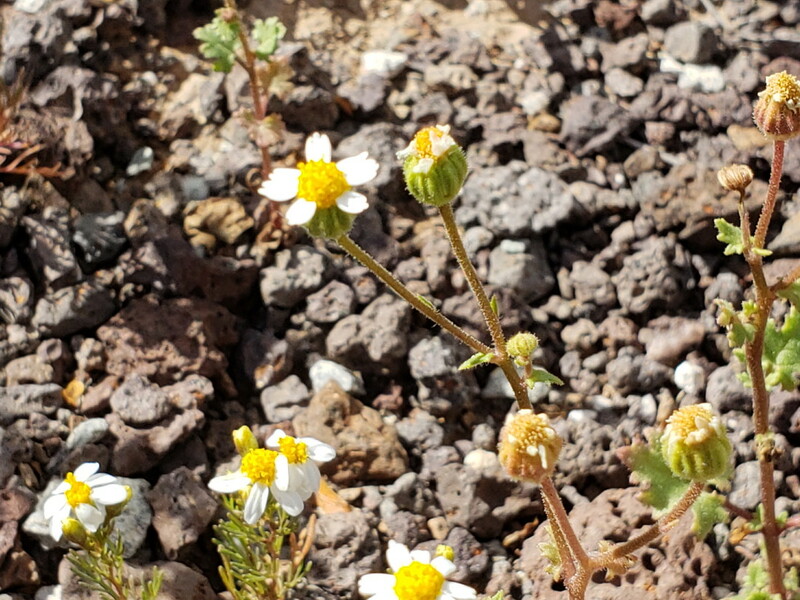 Another small flowering plant . Looks like a poppy, but is a type of desert mallow. The problem here is that the view goes on further than the normal panorama picture width. Jan likes this one----a younger organ pipe. This has to be one of the oldest. The older parts die off and younger ones start at the base. Some other flowers on bigger bushes. This small trailer, a variation of teardrop campers, is outfitted to go with the back country Jeep that was with it. The circle emblem is for Coachella Valley Overland. That is a group of thousands that enjoy using Jeeps on the off roads and backroads of the West. Everything on the desert takes time. The ocotillo wait for rain and then produce leaves and flowers for a short time. 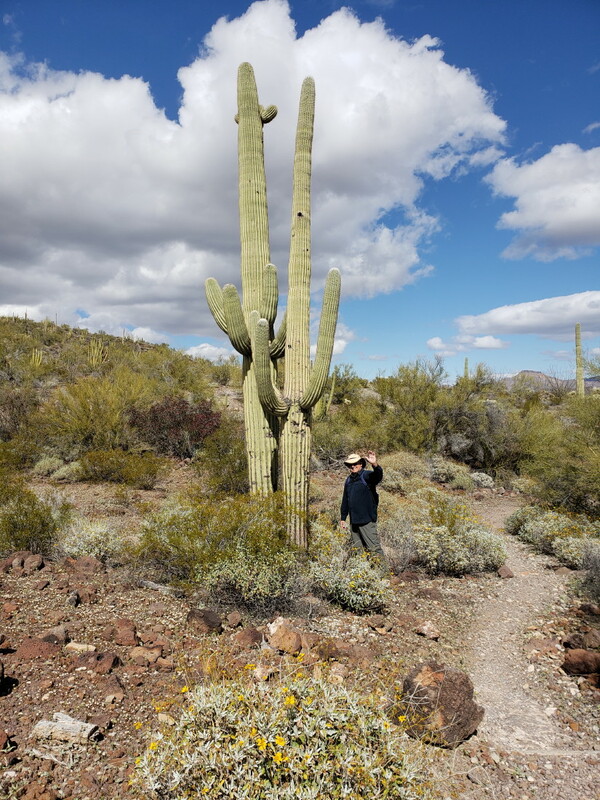 The saguaro grow ony 1 to 1.5 inches in the first years. They take 50 to 70 years before they grow arms. In a more extreme dry climate they could take 100 years. An adult is usually 125 years old and they can live up to 150 to 200 years and weigh 6 tons or more. Always on the lookout for RVs. This example was at Organ Pipe. 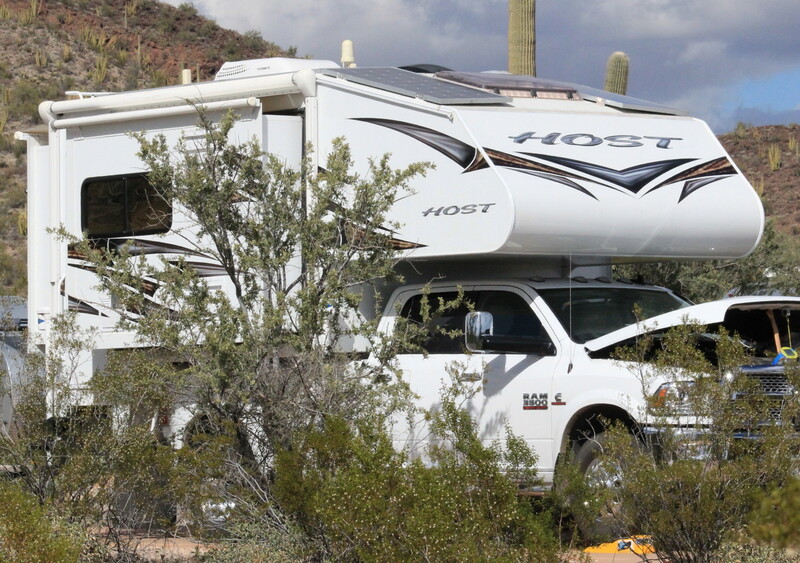 A Host truck camper on a dually truck. 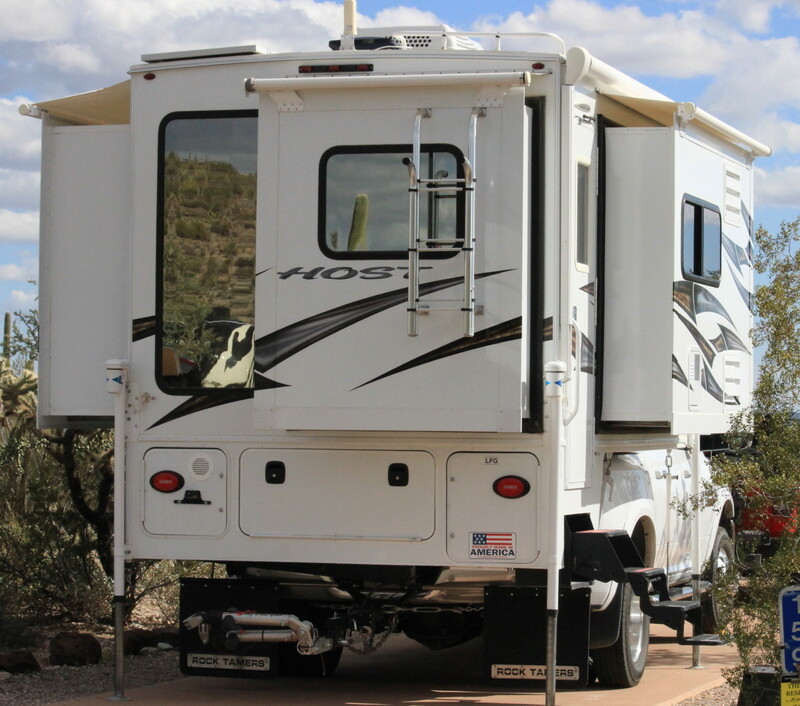 One thing about truck campers is that you will see some units that are stretching the weight limits of their trucks. A half ton truck with two rear wheels( one each side-think F150) is designed basically to carry a half ton or 1,000 lbs. 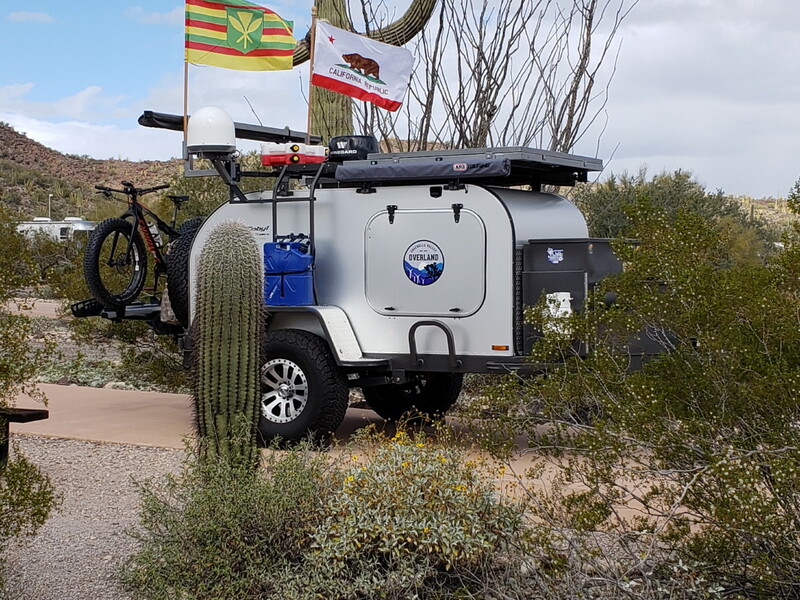 But you have to subtract the weight of passengers and add the weight of water, waste tanks, food, all other personal stuff to the weight of the camper. Now--the camper above is a great looking camper-- it weighs dry about 4,000 lbs. Hence the dually(4 rear wheels)truck Think Ford 350 or higher--a one ton truck plus. From the back you can see that there are 3 slide outs, and good storage underneath. The entrance is on the right side. Jan caught this video from the outside campground loop looking north. Some of the older Saguaro have holes in the arms. The cactus wrens are just starting to think about nesting. You can see this is and was a popular nesting spot. Okay. You have to click on this video and turn up your volume. You can see the Cactus Wren on top of the Saguaro. Lady Blue in our second spot at Organ Pipe. The hoods are open to try to keep pack rats that live in the Prickly Pear Cactus from finding things they like under your hood---like insulation and wiring. Not so soft and cuddly. You want to avoid these!! Couldn't resist the full moon and sunset colors on the far mountain. Or just the moon over a nearby Saguaro. So-------we knew a storm was coming. We had headed up Route 85 and then northeast on route 86 towards Tucson. This was Thursday. We woke up at Gilbert Ray County Park on Friday morning. The temperature was about 33 outside. It was supposed to be raining, but this is what we saw outside. It snowed into the afternoon. It continued into the afternoon. This was the same day that the entire area around Tucson and Phoenix up to the Grand Canyon received quite a lot of snow. Flagstaff recorded 40.3 inches of snow in the storm from late Wednesday through Friday. 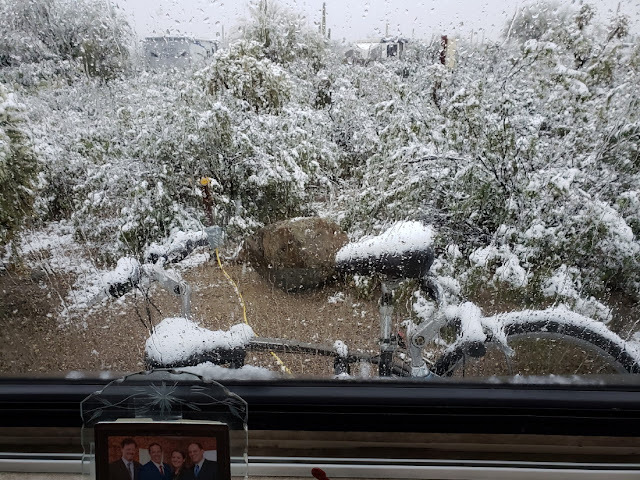 On Saturday, this was the view on Route 19 heading towards Route 10 in Tucson. That should be Mt. Lemmon, elevation 9,157 feet. For comparison, our campsite in Gilbert Ray, nearby, was 2,627 feet. 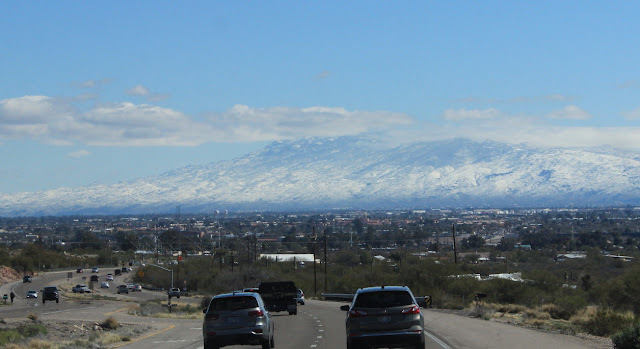 A short detour west on Route 10 gives us this great view of downtown Tucson, high rises, with snow covered mountains in the distance. 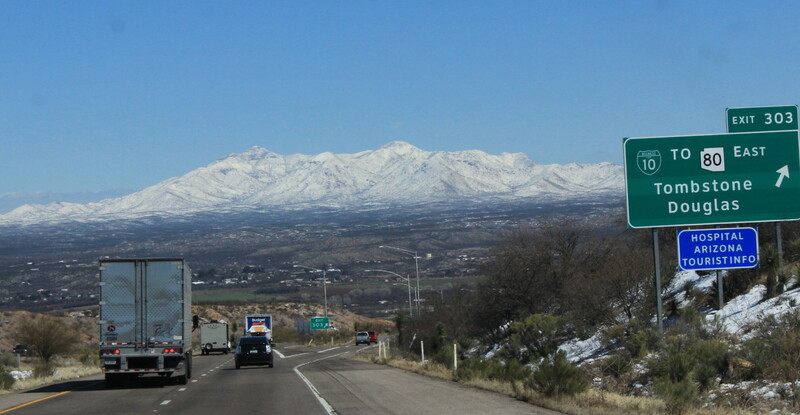 As we head east on Route 10 the elevation increases, and there is snow everywhere. Very unusual for Tucson area. New Englanders will find this unusual. This is the day after the snowstorm. The temperature is in the 40's now. Yet, driving on the Interstate, that was plowed, the snow on the side of the highway was still pure white. Super clean. Look at the foot of the hill and you will see about 25 cars of one of the sometimes 100 plus car trains. So strange to see cactus covered with snow. As we come off the hill , rolling northeast into Benson, Arizona. The view is northeast to some peaks over 7 to 8,000 feet. Note the exit for Route 80 which takes us to Kartchner Caverns Campground and then continues down to Tombstone. Just a light covering entering Kartchner. Jan and I liked these signs from Kartchner Campground. 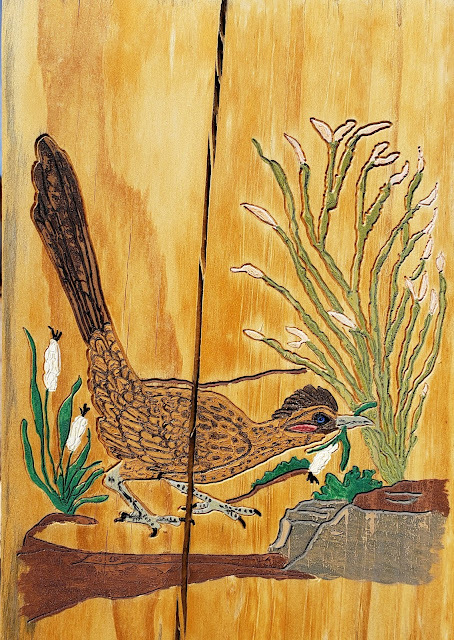 Looks like someone had etched a Roadrunner picture and more into the wood with a router and then painted everything and sealed it. Same thing with a log cabin , ocotillo, and more. Having some fun with our mini-MG from our 50th celebration.